puppies than deposits, we will have puppies available. 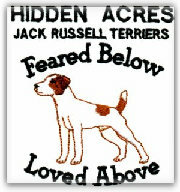 Hidden Acres Arial,Tri, Broken, 12.75"
If your interested in any of these litters Email us or give us a call. Being a breeder you can't keep them all. Some times we will have a pre-teen or adult available. Our puppies are often sold by reservation, we frequently have a waiting list. If you would like to reserve a puppy from a specified litter or want to secure a place on our waiting list, we require a $100.00 deposit. The deposit is applied toward the purchase price of the puppy. This is a non-refundable deposit, unless other arrangements have been made in advance. All "PET" puppies are sold on a spay/neuter agreement. 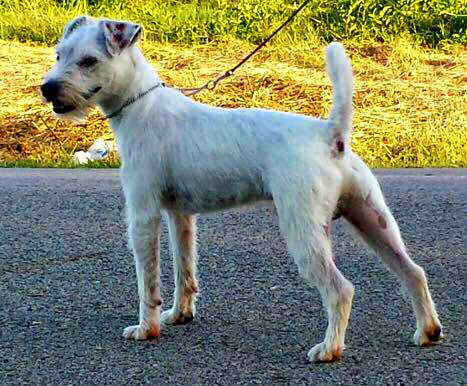 All show/breeding puppies are gauranteed registerable with the JRTCA at a year old.